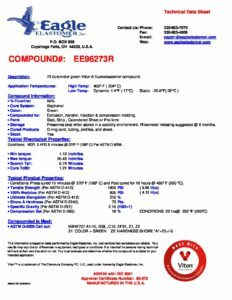 Viton Fluoroelastomer Compound EE96273R - Eagle Elastomer Inc.
 Compounded for: Extrusion, transfer, injection & compression molding.  Cured Products O-ring cord, tubing, profiles, and sheet.  Min torque: 1.12 Inch/lbs.  Max torque: 20.43 Inch/lbs.  Scorch Ts1: 0.74 Minutes.  Cure Tc90: 1.21 Minutes.